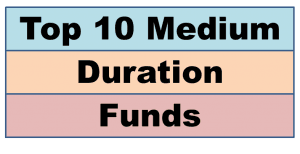 Here you will find the list of Top 10 Medium Duration Funds in India. Investing in these funds will give your funds a sustainable growth in a span of few months or years. In this Article, We will discuss in detail about Best Medium Duration Funds of 2019. We will analyze the performance of these 10 most invested Medium Duration Funds. What are Medium Duration Funds? Medium Duration Funds are mutal funds select those investment bonds which have an average maturity period with portfolio between 3 to 4 years which is also known as Macaulay Duration. The longer duration funds might be beneficial to get higher returns for the investors but are sensitive to interest rate changes. Most of the investment is done in the companies which have medium market capitalization i.e. they have a market cap between Rs.1.3 trillion to 6.5 trillion and have gained immense popularity among the investors. The mutual funds of India have increased its share in these funds which has increased its prices and thus made them an attractive investment category with huge growth potential. These funds are suitable to those investors who have a short to medium term investment horizon and seek higher return with low fluctuation and fixed income investment option. These schemes provide an opportunity for the investor to generate attractive returns with a moderate degree of liquidity via investment in money and debt market instruments for three to four years. However, there is no guarantee associated with such funds and it does not assure any kind of return to the investors. These are open-ended growth investment plan which was launched on 1st February 2013 with Benchmark of CRISIL MIP Blended Fund. It has an asset size of Rs.457.22 crore with a minimum investment of Rs.5000. These funds generate optimal returns in the medium term with the maintenance of liquidity of the given portfolio by investing in money market and debt related instruments. These are open-ended growth investment plan which was launched on 1st January 2013. It has a Benchmark of CRISIL Composite Bond Fund. They require a minimum investment of Rs.5000 with asset size of Rs.500.13 crore. The objective of this scheme is a generation of regular income in fixed income securities across the investment returns. It is a growth based open-ended fund type which has Benchmark of CRISIL Composite Bond Fund. It has a launch date of 1st January 2013 with an asset size of Rs.507.78 crore and a minimum investment of Rs.5000. It is an open-ended growth income scheme which tries to generate an attractive return which is inconsistent with prudent risk from a portfolio of high-quality debt securities. The scheme would seek capital appreciation when working as a secondary objective. It was launched on 1st January 2013 and has Benchmark of CRISIL Composite Bond Fund. It has an asset size of Rs.229.09 crore with the requirement of a minimum investment of Rs.500. The objective of this scheme is to generate regular capital appreciation and income by investing in a portfolio of money market instruments and medium-term debt. It is open-ended growth fund type which was launched on 28th March 2014 and has Benchmark of CRISIL Short Term Bond fund. It has an asset size of Rs.688.86 crore with the requirement of a minimum investment of Rs.5000. This scheme generates income through investments in money market and debt instruments with the main purpose of maximizing income without compromising with safety and liquidity. It is open-ended growth related fund which has a Benchmark of CRISIL AAA Medium-Term Bond Index and was launched on 26th January 2014. It requires a minimum investment of Rs.5000 with asset size of Rs.6697.71 crore. This scheme generates reasonable income by investing in money market and debt securities for the duration of three to four years. It does not assure achievement of any return from the given investment. It is open-ended growth investment plan which has launched date of 30th March 2015 and has Benchmark of CRISIL Composite Bond Fund. The minimum investment would be Rs.5000 with asset size of Rs.44.18 crore. This scheme helps the investor to generate regular income and capital appreciation by investing predominantly in a portfolio of debt securities which have maturity up to medium term. It is an open-ended growth investment plan which has the launching date of 1st February 2013. It has an asset size of Rs.1786.24 crore with a minimum investment of Rs.5000. The objective of this investment scheme is to generate a steady flow of income and medium to long-term gain by doing investment in income securities between the time periods of three to four years. It is an open-ended growth investment fund which was launched on 3rd January 2013 and has Benchmark of CRISIL Composite Bond Fund. It requires a minimum investment of Rs.5000 and asset size of Rs.12.77 crore. This scheme helps in generation of income by doing investment in a range of money market and debt instruments while maintaining the optimum balance of safety and liquidity. It is a growth based open-ended scheme which was launched on 1st February 2013 and has a Benchmark of CRISIL Short Term Bond Fund. It requires a minimum investment of Rs.5000 and asset size of Rs.1232.6 crore.